3 bedroom, 2 bathroom, living room, dining, kitchen, sleeps 6. Private pool and garden enclosed by high walls for privacy. Our three beautifully furnished 3 and 4-bedroom pool villas are set in a superbly maintained and landscaped residential estate with 24/7 gated security. Each villa opens onto its own private pool, sundeck and garden, enclosed by high walls for complete privacy. The villas are perfect for families or couples looking for a relaxing holiday in luxurious surroundings, but with Hua Hin's beaches, shopping, restaurants, nightlife and golf just a few minutes away. Nearby there are also local shops, a fresh food market, bars and some great restaurants. Busaba Estate is just off Soi 112 at the southern end of Hua Hin town, near Vana Nava water park. We (Kay and John) live in Villa 8 and will meet you on arrival. We will be happy to offer you advice on the local area or to assist in any way, but we will always respect your privacy. Our guests are provided with a local mobile phone for easy contact, but do feel free to come to our home. Busaba is a peaceful and relaxing place, with some permanent residents and regular holiday visitors. We ask guests to respect our neighbours by ensuring that noise is kept to a minimum. Busaba is not a noisy party place. HUA HIN is a favourite beach resort year-round for both Thai and foreign visitors, catering mainly for couples and families. The town has retained its traditional charm without the wild nightlife found in some other resorts, but has also developed all the modern facilities required by visitors. Hua Hin's climate is perfect, with lots of sunny days and the lowest rainfall in Thailand. GETTING AROUND: our Busaba taxi service (takes up to 10 people) waits at the estate entrance all day for the 10-minute ride to the beaches or the downtown shops, restaurants and nightlife. The standard fare is just 200 Baht. A car is not necessary, but we can arrange car and motor bike hire if you want to explore the area. 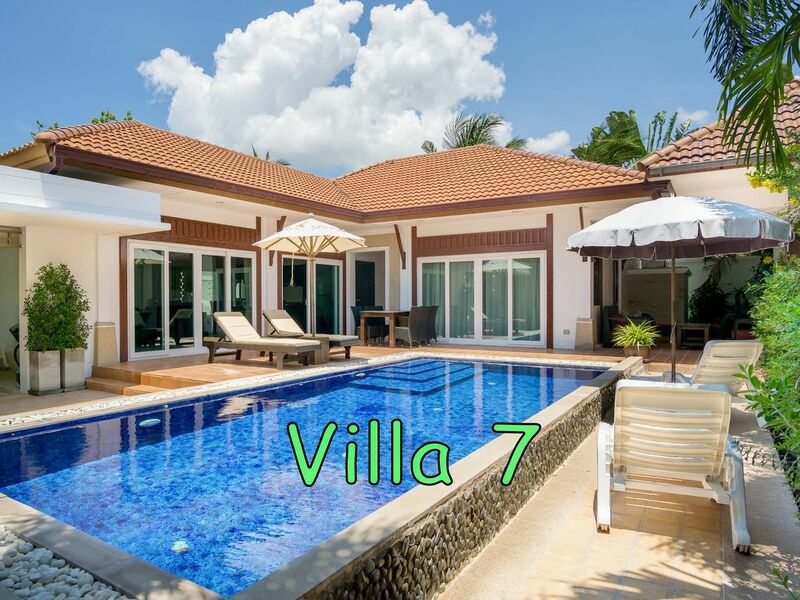 Pool villas are not typically found in the centre of Hua Hin, mainly apartments and hotels. Busaba is one of the nearest to the beaches and the town centre, but with local shops, restaurants, bars and a fresh food market nearby, many of our guests are happy to avoid the busy downtown area. BEACHES: apart from the main Hua Hin and Khao Takiab beaches there are many other beautiful and often deserted beaches to explore all along the coastline. Many offer water sports, restaurants serving the freshest seafood, Thai massage and manicure, or just relax with a beer taking in the tropical atmosphere. See our beach guide in the villa. DINING: bars and restaurants abound in Hua Hin, incl Thai, Seafood, Italian, French, Indian, Japanese and Fast Food. Right next to Busaba is Olive restaurant which serves delicious Thai and Italian dishes ... and with very friendly staff. See our restaurant guide in the villa. SHOPPING: there are several interesting markets and two modern shopping malls, Market Village with Tesco and Bluport Resort Mall with its Gourmet Market. Near the villa there are local shops, a Tesco Express, good restaurants, bars and a fresh food market. See our shopping guide in the villa. ACTIVITIES: the more energetic can enjoy golf, elephant and horse riding, water sports, go-karting or a day at the water park. The spectacular Vana Nava water theme park is just a short walk from the villa. Less active pursuits include the night markets offering a wealth of Thai crafts, a visit to the National Park, a relaxing spa treatment or a wander round the many temples. See our Hua Hin guide in the villa. GOLF: Hua Hin is Thailand's golfing capital with many world class courses. Sea Pines and Banyan are the nearest, just 10 minutes from Busaba. Black Mountain is considered one of the finest courses in Asia, just 25 minutes from the villa. Both Banyan and Black Mountain offer spectacular scenery and restaurants serving great food. Other nearby courses include Royal Hua Hin, Palm Hills, Springfield, Majestic Creek and Imperial Lake View. See our Hua Hin golf guide in the villa. If this all sounds just a bit too energetic, then the villa with its private pool is the ideal spot to simply relax. TRANSFERS: Hua Hin is usually a maximum 3-hour drive from Bangkok's two airports. We can arrange transfers by private minivan or car. Guests will be met at the airport or picked up at their hotel and transferred directly to the villa. FAST TRACK: as an option we can arrange Express Airport Arrival service to get you through the airport formalities as quickly as possible. This is very different to the standard "fast track" offered with business class tickets. Arriving guests will be met at the aircraft by a hostess and at least one porter, along with an electric buggy. The porter will take your hand luggage and the hostess will check your documents and ensure that everything is in order. You will then be driven to the immigration channels which can be a long walk from many arrival gates. Passengers on business class tickets will go through the priority immigration channel. After completing immigration you will be escorted to the baggage hall where the porter will collect your luggage. You will then be escorted through the customs checkpoint and out to your taxi. Kay is from Chiang Rai in the north of Thailand and John is from Scotland. When we discovered Busaba Pool Villas we instantly knew we had found our ideal home. We now have three holiday rental villas in Busaba and many repeat guests every year. Check out our reviews. Busaba is one of the finest residential estates in Hua Hin and our holiday villas are furnished to a very high standard. We are constantly enhancing and improving our Busaba properties to keep them in prime condition. Come and experience a Busaba holiday for yourself. You will not be disappointed. Busaba Estate is a superbly maintained oasis of luxury in Hua Hin, quiet and relaxing, yet only a few minutes from all of the town's attractions. Taxis are cheap and readily available. Each villa has its own private pool set in a garden surrounded by a high wall for complete privacy. The washing machine is in the outdoor laundry area. POOL - the pool deck has sun loungers, sunshades, BBQ, pool shower and a poolside sala. SMOKING - the villa is non-smoking indoors, but guests may do so on the pool deck. CHILDREN - a baby cot and high chair are available. An extra mattress is available for an additional child, PHONE - guests are provided with a local cellphone. HOUSEKEEPING - with a full linen change is provided once per week. Pool cleaning and gardening services are provided 2 days per week.